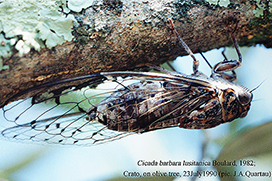 11561 recordings of 1586 animal species indexed in "FZ Sound Collection"
33620 recordings of 10642 animal species indexed in "Published Sounds"
Cicadas from Portugal: The sound of Summer. Surely most people have already heard cicadas in the hottest hours of summer, but perhaps few have ever seen them. They are essentially tropical insects (Hemiptera, Cicadoidea), being also frequent in the Mediterranean area. 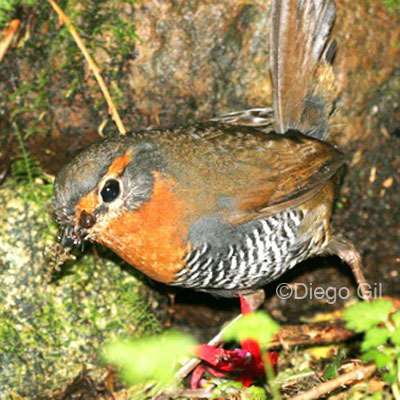 Thirteen distinct species are confirmed as occurring in Portugal, although there is still little information on some, namely on their distribution. In FonoZoo together with Dr. José Alberto Quartau we will make a tour through the different species and their curiosities, enjoying the sounds of these spectacular insects. 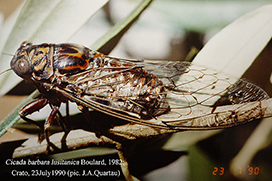 To know the generalities about the Portuguese Cicadas and listen to their sounds, click here. We will add a one different species periodically. New: sound environments of famous places. 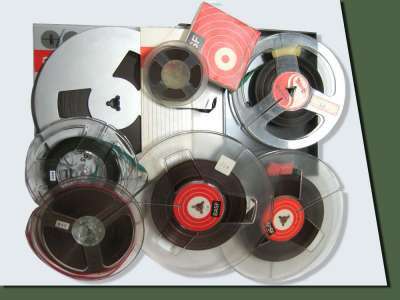 Search our catalogue of published recordings (CD, cassette, vinyl) at the Fonoteca Zoológica, by genus, specie or family. Some Sound Guides edited by the Fonoteca Zoológica and Alosa (Sounds of Nature).